“Yes I can!” you confidently pronounce. Although plasma node leadership isn’t your consulting firm’s focus, you feel great about the lucrative project you’re about to capture. “No, I’m afraid that’s not in my wheelhouse,” you respectfully reply. Although you’ve declined a tempting opportunity, you’re invigorated by your disciplined adherence to your consulting firm’s strategy. Which is the right answer when a prospect invites you to work on a project outside your firm’s core? Let’s discuss that. The easy answer is Yes. That’s a layup. Barney wants you, you want business, you exchange “I dos” and life is good. Creates Room for Good Projects. 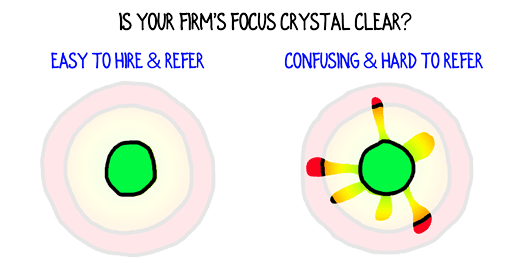 Spurning off-strategy projects, low margin projects, and/or projects with undesirable clients reserves capacity for on-strategy, high-margin consulting projects with fabulous clients. Drives You to Win Good Business. You’ve made room for the type of consulting work you want and, huh, now there’s a hole in your revenue that you have to fill! Increases Referrals. The clarity and specificity that boosts sales also makes it easy for Barney to remember you and refer you to others. Should you ever say “Yes I can” to off-strategy projects? Of course. It’s unrealistic and silly to adopt a blindly rigid stance. Say Yes if Barney is a current client. Expanding within current clients is good consulting business and broadens your capabilities. Plus, existing clients will typically approach you with consulting projects that extend naturally from your core. Usually say No if Barney is a new client. An unfamiliar prospect offering you an off-strategy consulting project is a trap. Accepting these initiatives dilutes your focus and, therefore, the deleterious long-term effect on revenue exceeds any short term influx of cash. Say Yes if Barney is a new client only if you’re running on empty. If you literally have no clients and no consulting revenue coming in, that could be the market signaling you to shift direction. Saying “Yes I can” could be the first step in establishing a more profitable, successful consulting firm that focuses on, say, plasma node leadership. As your core consulting businesses surpasses $1-2 million in revenue, consider expanding your core to include closely related offerings. When your core offering reaches a stable $4-7 million in consulting revenue, consider adding another core offering to your firm. Do you usually say “Yes I can” or “No thank you” to prospects who offer you off-strategy consulting projects? Dang, I totally forgot to mention not take projects with the mob. Separately, it’s important to only take on projects within your capabilities and to not let your capabilities define the projects you accept. Most consultants won’t suggest they can handle a project that’s far outside their skill set; however, many small consulting firms will pursue every project they could do, regardless of whether it’s on strategy. That’s the big mistake that holds small firms back. Thanks for the input and the funny anecdote, Robin. David, would you help me understand your “it’s important to only take on projects within your capabilities and to not let your capabilities define the projects you accept”. To me taking project within capabilities sound the same as if capabilities defined projects I accept. Does this mean “accept projects within your core capabilities, not all of them”? Part 1: There are many, many areas in which you don’t have well-developed (or any) skills. Projects in those areas you should definitely turn down. Hence, only take on projects within your capabilities. Part 2: You also have the capability to do many, many, many things. Therefore, you could accept an extremely broad range of assignments. However, if you accept every project you’re capable of completing, you put your strategic focus in danger. Hence, don’t let your capabilities define the projects you accept. I think I got it now. These are not two alternatives, rather two consecutive limits to apply. They boil down to “first accept projects within your strategic core”. This sounds like an application of Johari window tool to core/non core, new/old client. Sure, we can go with that. My recollection (from 30+ years ago) is that the Johari window was named after two guys: Joe and Harry. So, let’s call this the Dada window, named after David and… uhm…. yeah, just David. Robin, I think gaining capabilities to find a strategy and develop core is a wrong-side-up thinking. 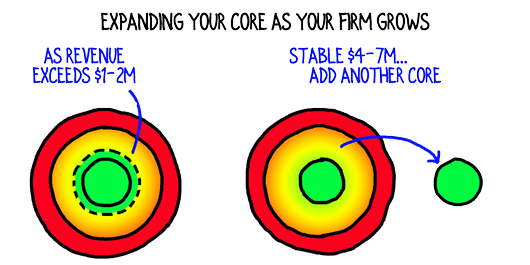 To me core should be defined by clients’ needs and then capabilities must be developed to fill the core. I just declined a project from a potential overseas client who asked me to help them in an area that is related to but outside my core as you described. I met them over a year ago and discussed how we can solve their problems and they were skittish at the time. They did not want to follow the proposals that my partner and I made but tried several other options in an attempt to fix the issue and “save money”. Now they’ve come back and want me to help them again but to re-design the process in a new way when they still haven’t shown interest in the logical and obvious approach that we suggested. When I combine the fact that this project is outside my core and a bit of a stretch for my capabilities along with the way they tried to use price pressure (and my cash flow was tight) and with the fact that my schedule is totally full now, I decided to decline. Too much risk in a non-core area that could impact my ability to meet existing clients needs with the time I have available. Thanks for the well times article. Sounds like you made a very wise decision on a prospect who would have turned into a difficult client. Congratulations on sticking to your guns and, even more, on having a busy practice that supports sound, strategic decisions. David, You do such a great job at simply communicating complex situations. Love your graphics. Thank you for the kind words and support, Theresa. Conversations with smart consultants like you are always educational and lead to the articles. Then, we all have to think through the issues carefully, challenge assumptions, and find the core learning in order to communicate simply. That’s why I appreciate you being part of the conversation. If the client is an organization I’ve either worked with in the past or would like to in the future, I do my best to refer them to someone for whom the project is a core product. In one case, the person I recommended was perfect for the deliverable, but didn’t have the project management experience. So I did the PM part and my friend did the work for the client. We both got paid and the client was thrilled. Christina, you’ve brought up an excellent alternative for consultants who have an opportunity close to their core but outside their current skill set: subcontract. As long as you are up front with the client, you’re good. Be careful about project managing too many non-core projects, though. That takes capacity away from the projects that will directly build your business. Thanks for the excellent addition to the conversation. Interestingly, CMC-Canada’s Code of Conduct states that “Certified Members shall not undertake assignments for which they do not have relevant qualifications including education and experience even if a client, aware of this limitation, specifically requests that they do so.” I find this a bit limiting in terms of expanding your own competencies but as Christina stated, partnering with another consultant is beneficial for projects where it doesn’t fit within one’s core competency but you wish to expand in that area or complement your area of weakness. Cheryl, there’s definitely benefit to partnering with other consultants to expand your skill set. I couldn’t agree with you more. 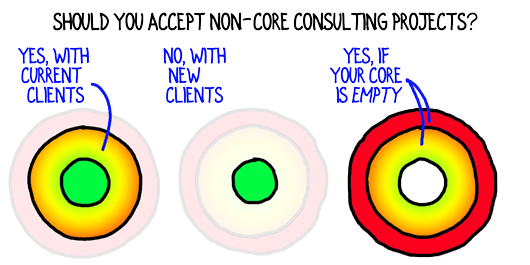 What I find interesting is the distinction between a consulting firm’s core competency and their core strategy. The former is virtually always broader than the latter. We have to narrow our focus while expanding our capabilities. On the surface it appears paradoxical; however, it’s at the heart of successfully growing a profitable consulting firm.